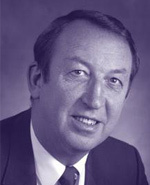 (1985-1994) Before coming to Western, Dr. Pedersen was president of the University of British Columbia and said he was leaving B.C. to make a statement about that province's education financing policies; however, growing concern about government cutbacks was also an issue in Ontario and at Western. Prior to his post at UBC, the Alberta native had also served as president of Simon Fraser University and vice-president academic at the University of Victoria. He earned a BA from UBC, an MA from the University of Washington and a doctorate from the University of Chicago, where he studied the administration and economics of education. Pedersen believed research activity should drive teaching activity, a notion he saw as fundamental to the success of any university. He strove to gain an international reputation for Western by promoting the quality of its scholarly work, the merits of its graduates, and by encouraging links with other universities around the world through research and faculty and student exchanges. He also increased international student enrollment. During Pedersen's presidency, many new programs and buildings were established, several as a result of the Renaissance Campaign which raised more than $126 million for the University.